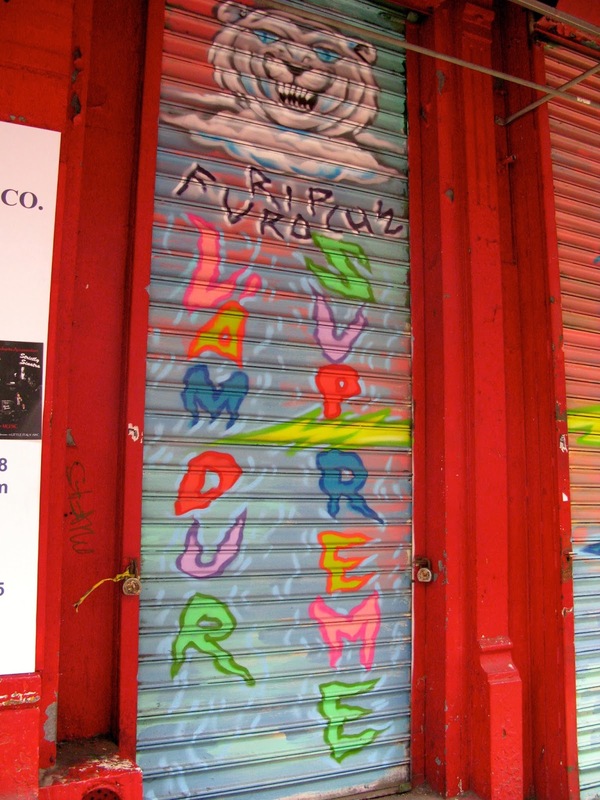 As this art-filled summer comes to an end, I find myself yet again in the Lower East Side and Little Italy neighborhoods of lower Manhattan. From Houston St. and below, art is plentiful, and I wanted to take advantage of walking around for miles while I still could. Doesn't this wall just scream summertime?! Another melty mural by Buff Monster, I'd been waiting for the perfect opportunity to go see this piece on Bowery and Broome. It's rolled up during the day when the storefront is open, and I'd only seen the corners of it until now. And WOW was it worth the wait! This has to be the largest mural up in the Lower East Side, and with a powerful message to go along with it. 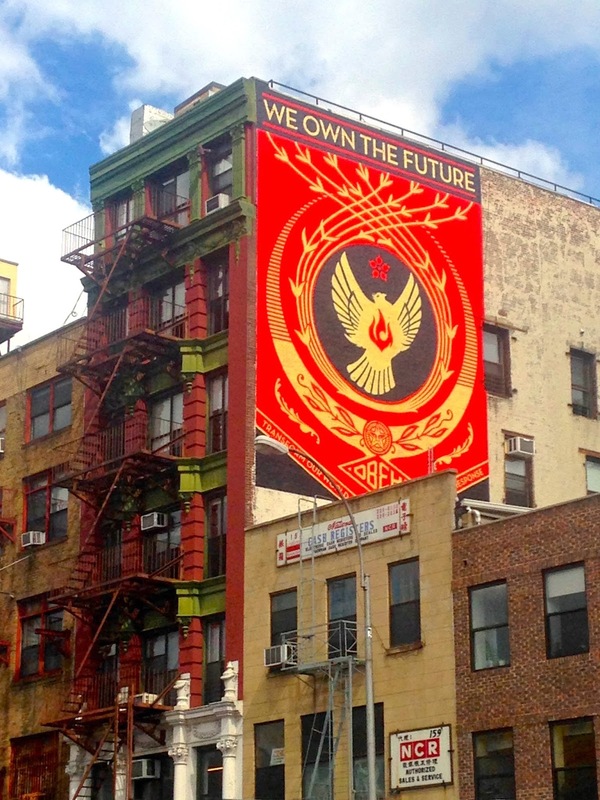 Titled "We Own The Future", Shepard Fairey's latest piece is a beautiful one that you can admire from blocks away. Up close, you can see the words of wisdom from the Obey Giant himself--"Transform our world through creative response." An appropriate message for the soulful neighborhood of the Lower East Side, I could only wish that was the view outside my bedroom window. From the ground, and through a camera lens, this picture just doesn't do the real thing justice. 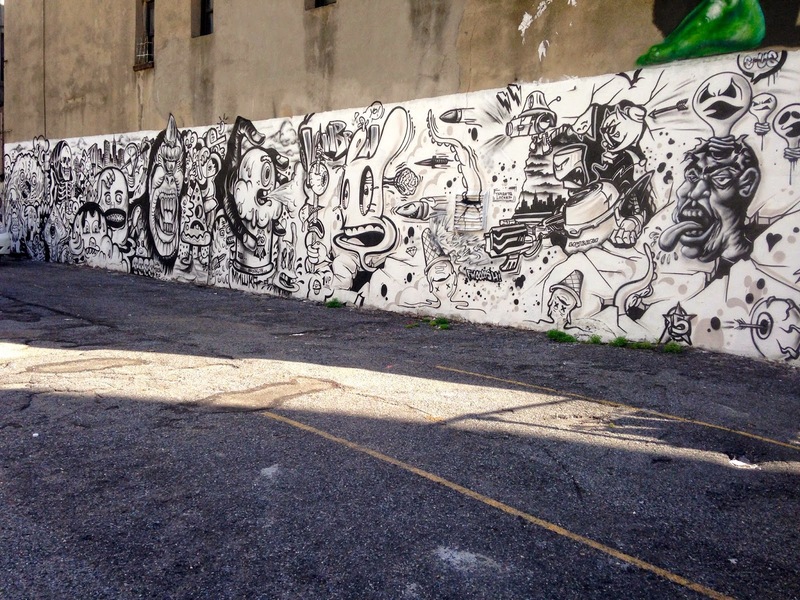 Check out the view from Buff Monster's studio space across the street on his Instagram here. Walking through the Lower East Side another day, I passed by to check out a new mural from one of my favorite artists, Jerkface. 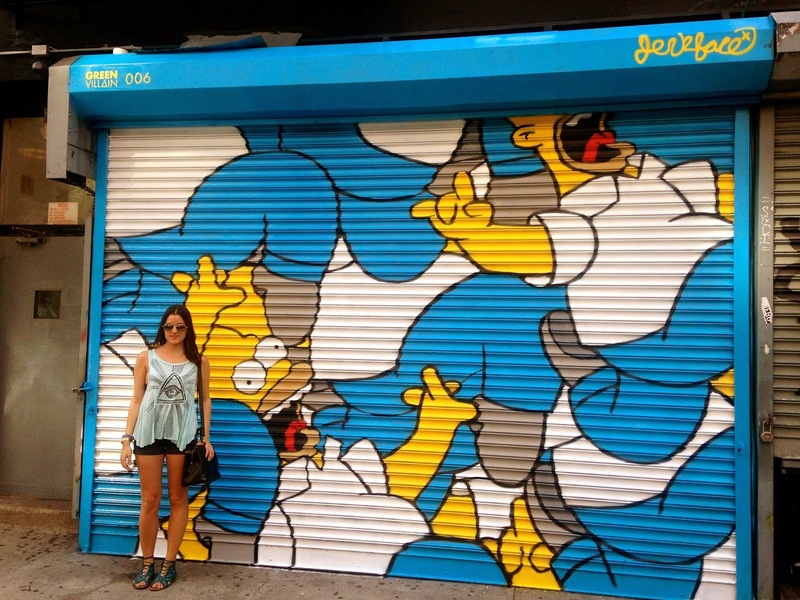 His new piece is titled "Homer's Inferno", and luckily doesn't have the time constraints that the Buff Monster piece did. Just around the corner, I ran into a colorful surprise. 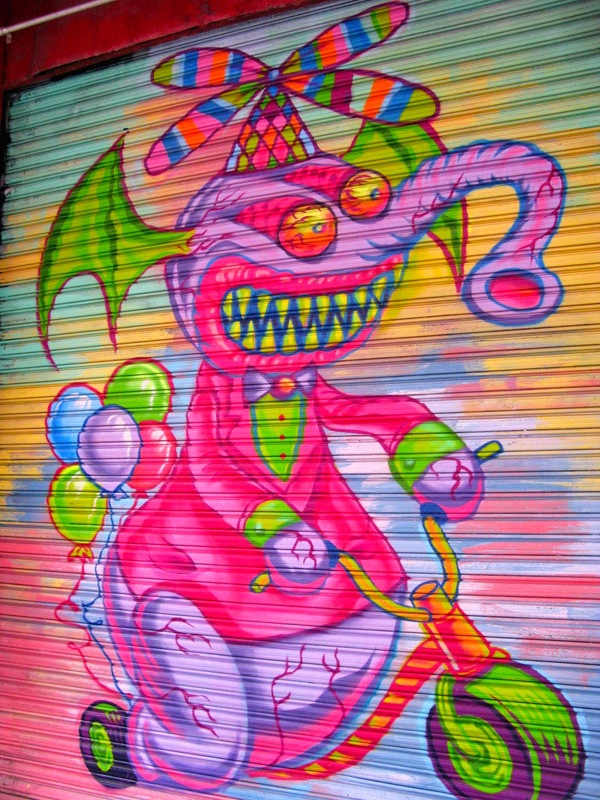 A promo for Mister Spoils, an online men's newsletter and website, this mural is the classic style of Jason Woodside's work. It pops against the concrete in a way that makes you want to party. Awesome!! This garage door trio on Mulberry by L'amour Supreme is part of the LISA Project, and it's in one of the busiest sections of Little Italy. Whether there's a man in a cannoli suit in front (not a joke), or tables filled with pizza and wine, or ladders and 2x4's, I've been trying to get a shot of each door before I posted them all together. You can see more pictures on L'amour Supreme's Instagram here! Last but most certainly not least, this creepy character is in a hidden parking lot on Mulberry. I've probably walked past it 10 times before noticing it, but now it catches my eye every time. Warning: the closer you look at it, the crazier it is! 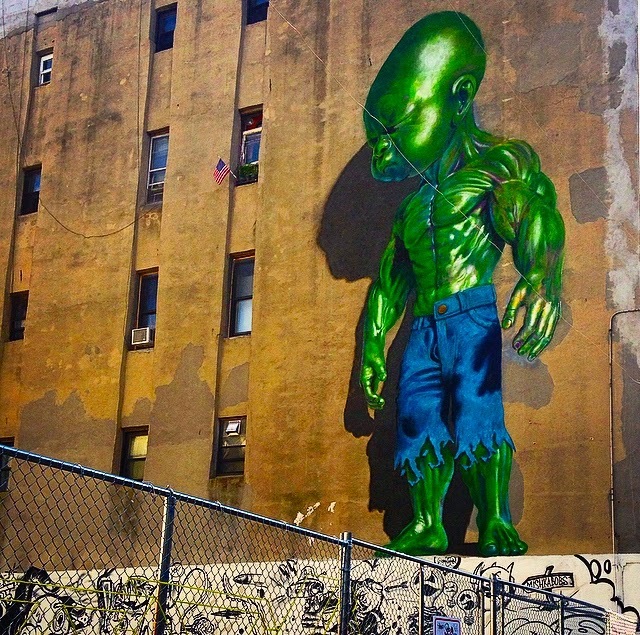 Ron English can really make painting pop--this baby hulk is so 3-D in person! And below, a collaboration by artists including Sheryo and the Yok, Meres One and Buff Monster. Too bad they wouldn't let me in the private lot to get closer shots. You'll have to enjoy it from afar like I did! Of course, as a Californian born, I'm sad to see the summer and good weather go. But the art changes with the seasons, and I'm always excited to see what is next.